Chickens are omnivores! In many classic TV westerns, chickens are shown eating grain and corn thrown by a ranch-hand or child. Because this is primarily their food source on farms, it has led some people to assume that chickens are vegetarians. Chickens are actually omnivores who enjoy many insects, and in some case, small frogs, mice, snakes, and bugs! They do also enjoy fresh plants and corn, but that is not their only source of nutrition. Free-range chickens enjoy snapping up pieces of grass, a couple bugs, and perhaps even a small mouse while out on the range. 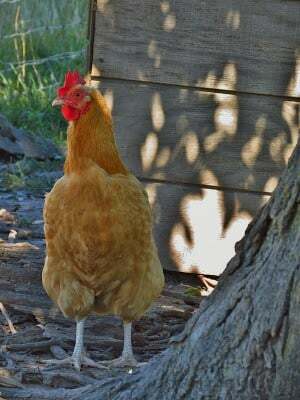 All our table scraps go to the chickens. On the farm 70 years ago the same. There was no plumbing. All food scraps went out the back door and were pounced upon by the flock. We have 5 free rangers now and they get very little corn. They even enjoy some cheap hamburger from time to time. We make our own dog food too. Nothing gets wasted. Egg shells and coffee grinds etc end up on the compost too. Some egg shells are crushed and given back to the chicks. Fishheads are slow cooked for stock and the bones dried and smashed for the chickens an an old towel with a mallet. We love our eggs. Got goats or Pigs? Make friends with a restaurant and give them a 5 gal pail to save table scraps for them~!